From Grange Park Retirement Centre Old Coulsdon. .
For more information please send a message to the Groups Co-ordinator. 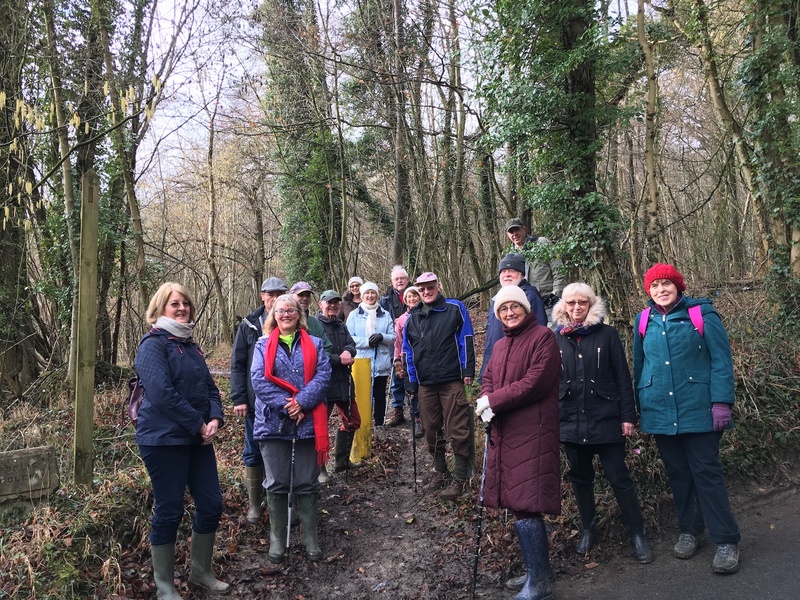 The group meets monthly normally on a Wednesday or Thursday at 10.30 and undertakes a walk of 1 to 1 1/2 hours, following a route set by the Group Leader. It usually starts and ends at a pub/cafe, and some of the group have a drink and lunch together after the walk (although this is optional, and at own expense). Details of the upcoming walk and meeting place are sent out a 2-3 weeks in advance to those members who have registered with the group. The walks are selected on the basis that they only have a few stiles at the most, and not very steep slopes. If you are interested in registering for the group, please use the pigeon post icon on the top right hand of the page, or contact the Groups Co-Ordinator. Contact please use Pigeon Post icon in top right hand of this page, or contact the Groups Co-Ordinator. The following gives some idea of the flavour of our Short Walks, and refers to the walk undertaken in early February. 17 brave souls from the Short Walks Group, ignored the morning rain, and the cold weather and went on the Short Walks expedition to Godstone. The walk started and ended at Godstone Vineyard, and in between we had some challenging steps and a lot of mud! The total walk was 3.5 km, and involved effectively climbing 6 flights of stairs (and some great views from the ridge). The plan was to enjoy a meal in the Godstone Vineyard cafe at the end of the walk, but at the last minute we were told that it was closed, and we therefore adjourned to the Knights Garden Centre cafe at Oxted. A very pleasant location, serving great light meals. Fortunately, despite the rain in the morning, it was dry for the walk, and the sun actually shone, as is evidenced in the photo. Well done to Chris and Heather for organising the Group, and to Jim and Julia who did a lot of recce work in the cold to find the right walk for the weather conditions."